I was a little motivated to try the one stroke thingy, Maria is great at it and i wanted to give it a shot. This is my attempt at it. I really need lots of practice and a better brush. 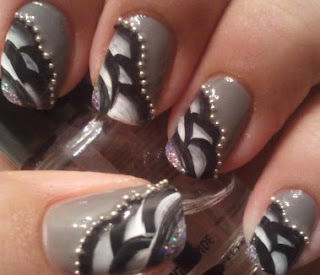 But I have come to peace with this manicure at first i hated it. 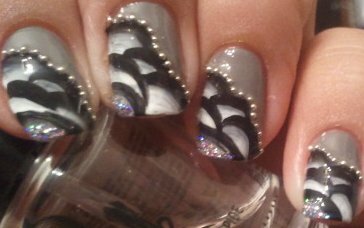 / Me motive a intentar un maicure de "one stroke", Maria es genial en ese tipo de manicures asi que lo intente. Todavia necesito muchisima practica y una mejor brocha pero creo que me gusto un poco, al principio de verdad odie este manicure. 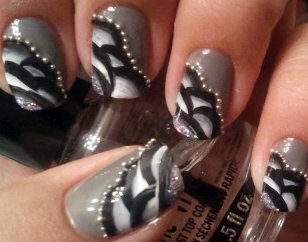 I don't know what the 1 stroke thing is but i really like this mani! It reminds me of rolling hills but in stormy greys!!! Te quedó super linda! Me encanta! 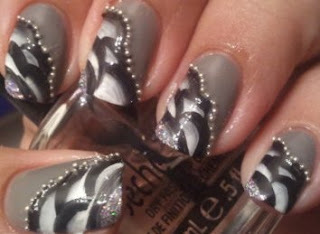 I really love this mani, Lydia - very elegant and nice, well done!